Discover the tallest, shortest, heaviest, fastest, loudest, and richest plus thousands of other amazing facts and feats at the Guinness World Records Museum on Clifton Hill in Niagara Falls. The museum brings the television show and the world famous Guinness Book of Records to life! You've read the book and seen the action on TV. Now experience all the excitement for yourself at this popular attraction. Marvel at The Kugel, a 10,000 lb. granite ball that you can turn as it floats on water. 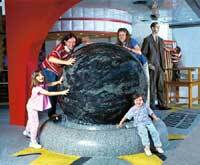 This 5' sphere is made from Amadeus Granite and sits on a base of Tittlinger Granite. For more information visit the official Guinness World of Records web site.